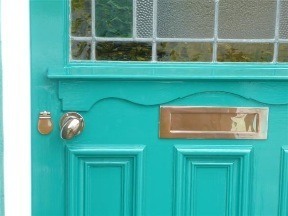 The brief was to gloss paint the front door, so it was the shiniest in the village, and that is what they got! Apparently the joiner who fitted the furniture said the paintwork was like glass. With 16 hours and 6 coats invested in it, no wonder! Before burning off the paint with a hot air gun, I removed all the door furniture, laid heavy duty paper under the door inside and out, and laid plastic sheeting on the floor on the other side of the door. I regularly vacuumed up any dust and dirt. It took about 4 hours to get it down to the bare wood, and an hour to clean off the bits. The bare wood was primed with Dulux Weathershield Preservative Primer, a runny liquid with a green tinge. I suspect it is tinted green for marketing purposes only! See update below since 2010, some oil paint systems have changed. 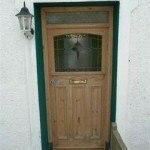 Once primed, the door was undercoated with oil-based Trade Weathershield. 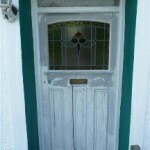 If you want a good base from which to achieve the shiniest door in the village, the undercoat has to be oil-based, so I made sure it was TRADE Weathershield, as opposed to Dulux Weathershield from the DIY superstores, which was water-based! When undercoated, the door is ready to be filled. I skimmed all the panels, stiles and rails with Polycell trade filler and brushed watered down filler on all the mouldings. It takes a couple of hours for it to dry hard. After a gentle rub down with light grade sandpaper, the dust was removed with the vacuum, every square inch was wiped over with a tack rag, and it was undercoated. 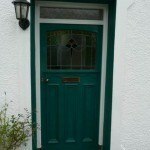 The door was undercoated and filled 3 times in all, before being ready for glossing. Original post Aug 2009, updated March 2012 Since 2010 governmental legislation, many oil paint formulations have changed and the usual paint companies haven’t always moved well with the times. Many decorators using Dulux trade oil-based paints, for instance, have encountered issues with slow-drying, not to mention the phenomenon of over-shiny undercoats which don’t provide a chalky flat high build base for higher oil content topcoats. 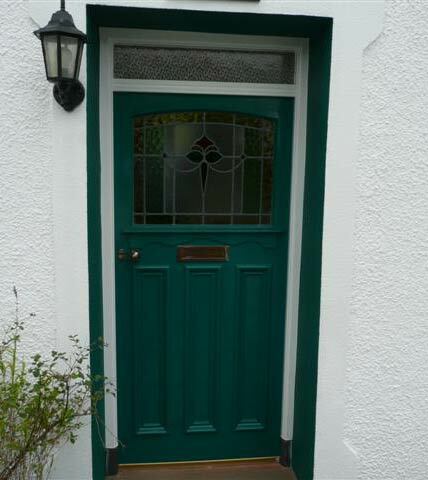 It is not uncommon for current oil based gloss paintwork on exterior doors to remain tacky for a couple of days, which makes sanding down between coats problematic. The designer “posh” oil based gloss paints from Little Greene and Paint Library are still reliable, though, and Sikkens have gone part way to solving drying problems without sacrificing quality with their Rubbol BL Primer (water based primer – undercoat – which I think provides a quick drying super solid flat base for Sikkens AZ or XD oil based gloss. Ironically (or do I mean annoyingly?) whilst the Rubbol primer dries hard enough for sanding in a matter of hours, the oil gloss will struggle to dry in a day, in anything other than warm conditions. 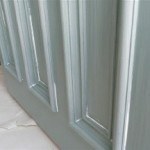 So beware closing painted exterior doors, if you don’t want to spoil the effect. Whilst it is fair to say that Sikkens are ahead of the game, Traditional Painters will be specifying paints from Scandinavia that are not only water-borne, but have been proven to perform for 8-10 years between cycles. Best of all worlds! Quick drying and extraordinarily durable. For an even stronger shinier base, I would substitute conventional filler with oil-based Swedish Putty which is available in Europe as Toupret Gras a Lacquer, or Beissier Gras a Laquer. It goes on super thin, and dries off quickly ready for more skim if necessary. Leave overnight and sand smooth with wet n dry abrasive used wet. It can be applied either over the primer or the undercoat with no perceivable difference in final result. So, materials are a-changing, but otherwise the same principles of traditional painting practice apply. The last job before applying the first coat of gloss is to “gun up” the joints down the side of the mouldings. When the flexible acrylic has dried hard, the door is glossed. I did this early in the morning, so the paint had a good 12 hours to dry. The following day I lightly sanded the door with wet ‘n dry, used wet, cleaned it off with a tack rag, and put on the second coat. The finishing touch was to replace the door furniture with a new bronze set. The handle is oval, which suits the grip of older homeowners, and the bronze is completely maintenance-free, and will acquire a greenish patina over time. Entering its fourth year now, there is no sign of wear and tear, so not all bad! 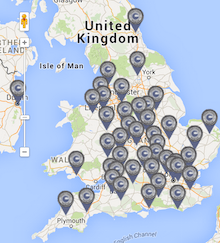 But that Dulux paint system is not around now. Tikkurila Miranol or Sikkens XD are the shiniest toughest oil gloss around. If you like the Traditional Painter approach to general decorating, please contact a TP Associate Painter and Decorator. Please bear in mind, they are all about the quality, and will not take shortcuts to meet a low ball budget. However their prices will be competitive with the normal decorator rates charged by established companies in your area. Is this a daft thng to do in winter? Or can I do the stages bit by bit and wait for a good forecast for the day? Should I use a brush or roller for the gloss paint or both? Hi, if working with oil paint outside, I think the main issue is the dew point in winter. You dont want moisture involved in the proces, so even a good day you cant really be painting before 10 and certainly not after 2. Oil paint, depending on the brand, can be touch dry in that time, until you go shutting the door – if not dried off, shutting a binding door will defeat the object. You could erect an awning over the front door, that would help, depends how far you want to go, how anxious to get the door done before the Spring. Re roller and brush. The roll and tip approach is suitable if you arent confident with your brushing skills, or if speed is the issue because of weather conditions (less of an issue if you have a paint conditioner like Owatrol added). Alternatively, if you use a very soft bristle brush to eradicate brush marks eg a Wooster Alpha is very soft, but if the oil paint is sticky it isn’t the best paint spreader on large panels, so I would use a roller to get the paint on and spread out before lightly working out any marks. Or you can use a natural bristle brush the old way, or I am very happy with the Wooster FTP Chinex, and of course, lwyas have Owatrol added. But in winter, I wouldn’t sign up for a Number 10 finish if working open to the elements. Alternatively, if you use a very soft bristle brush to eradicate brush marks eg a Wooster Alpha is very soft, but if the oil paint is sticky it isn’t the best paint spreader on large panels, so I would use a roller to get the paint on and spread out before lightly working out any marks. Or you can use a natural bristle brush the old way, or I am very happy with the Wooster FTP Chinex, and of course, always have Owatrol added. But in winter, I wouldn’t sign up for a Number 10 finish if working open to the elements. What is best primer for (possible?) hardwood door on exposed westerly facing seaside door? I do notnot know what kind of wood it is but it is not pine. Paint does not last long over traditional primer. Could I use a zinnzer product? I’ve developed a manetl alert for white gloss paint as well – I went right off it for years as it used to turn a little yellow, but I guess paint technology has moved on. All my eggshell surfaces are quaking in their boots. Thank you very much for all the tips and for your website! I’ve got a question regarding filler you mentioned Polycell trade filler been used in this project. Could you name the filler please is it ready mixed one? 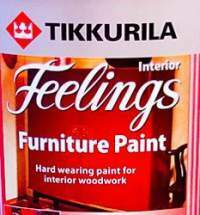 And what filler would you recommend to skim over woodwork skirts, sills etc..? I’m using Upol 2 part filler at the moment. That door was painted in 2009, (still going strong) but the materials either aren’t around now, or bear no resemblance to the formulations used. The best practice now is probably Sikkens XD gloss finish, and use Toupret TX 110 for big holes and skim with Gras a Laquer for a number 10 smooth finish. Or go over the top and use Signwriters enamel instead of the Sikkens XD.